The cliffs of Point Lobos are filled with TEXTURE. The water in each of these pictures is a good place to point out TEXTURE. The stormy waves in Point Lobos contrast the calmer water in The Long Leg. Use a slightly moist piece of sponge, dabbed in white paint, to create white caps on a painted blue sea. Blot the white sponge a couple of times, on scrap paper or newsprint, then dab on the top areas of the water. This will also create TEXTURE in the waves. Because the artists use several TINTS and SHADES of blue in the water, a project using one of the worksheets titled Color—Tints and Values, and Color—Shades and Values would be great with this packet (especially for Grades 3 and 4). Tempera paint works best! Kids always love to paint, even if it is only color mixing and not an actual picture. Compare the BALANCE in Sunset at Sea, On the Lee Shore, and The Long Leg with Yawl Riding a Swell, The Gulf Stream and The Herring Net. Discuss how the artists have drawn our attention to the edges of the pictures in the first three seascapes and to the center of the pictures in the last three (MOVEMENT, FOCAL POINT or CENTER OF ATTENTION). What can we see in the FOREGROUND (area closest to the viewer)? STYLE: An artistic technique. The way of showing or expressing what is seen. Style is an artist’s particular way of expressing, using materials, constructing, or designing what is characteristic of a person, group or culture. Style is a means of expression, using materials, design arrangements, methods of working and choice of subject matter as a way of showing the unique qualities of an individual, culture or time period. IMPRESSIONISM: A name derived from a painting by Monet, entitles “Impression: Sunrise” (1872) and given to an entire artistic movement. Originated by Monet, Pissaro, Renoir, Sisely, Boudin, Degas and Morisot, it was a method of painting in small vibrant dabs of color, often straight from the tube. By this technique the Impressionists attempted to recreate the effects of light in nature. They emphasized painting outside and catching the effects of light on things at different times of day. Impressionists used unblended dabs and slashes of pure color, placed close together, to create a MOOD or impression of a scene. This style of painting does not use much detail. From close up you cannot tell what the picture is supposed to be because it seems like just a lot of colorful dabs of paint. As you stem away from an impressionist painting, the dabs blue and blend together to form the picture. Edward Hopper was born the small town of Nyak, New York, on July 22, 1882. Edward had an older sister named Marion and was the only son of Elizabeth and Garrett Henry Hopper in a solidly middle-class family. The Hoppers owned and ran a dry-goods store. Their home was only a block away from the Hudson River. At the time of Edward’s childhood, Nyak was a busy port town with a thriving shipyard that specialized in building racing yachts. 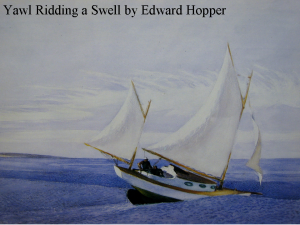 Edward had an early childhood fascination with the river and built his own small sailboat. 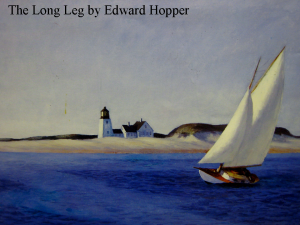 Hopper was drawn, not only to sailing boats, but also to every type of seagoing vessel and some of his most successful paintings depict nautical themes. Edward was so interested in boats that he also once considered a career as a naval architect. Edward’s mother encouraged his interest in art from an early age. By the age of 10, Eddie, as his friends called him, was signing and dating his drawings, which proved he had talent. Many of these childhood drawings still survive today. 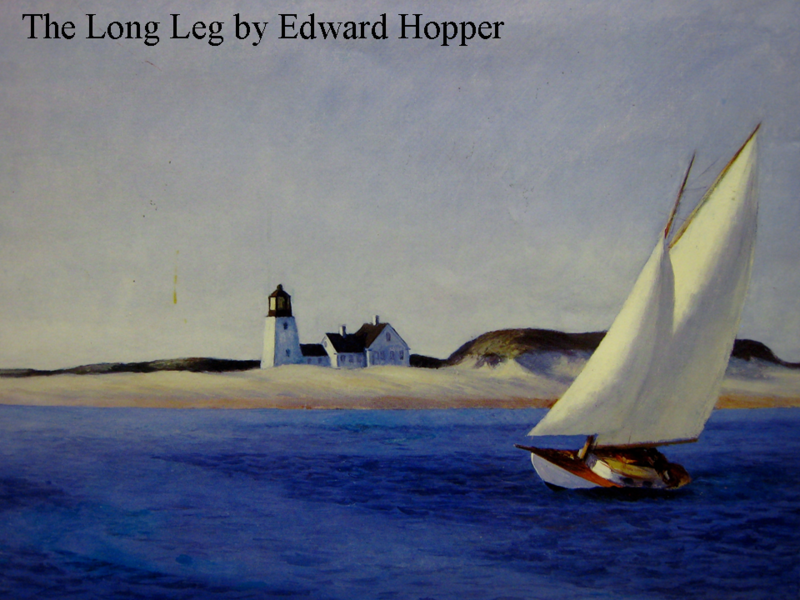 Edward Hopper was part of a group of artists who were known as painters of the American Scene. These artists broke away from the popularity of Abstract art and went back to showing Americans in their familiar setting. Hopper’s painting expressed feelings of loneliness and isolation. He achieved this sense of loneliness in his paintings through strong, solid shapes and his use of lighting and shadows. Because he left out much of the detail, Hopper’s paintings have an abstract power, although they are realistic. Can you find two triangles on the surface of the water? Areas of darker water create the triangles, the largest on the right (the boat sits in the triangle), and the smaller on the far left. What are lighthouses for? Have any of you ever been in a lighthouse? Find pictures of various types of boats in a book or an encyclopedia. Draw pictures of different types of boats like steamers, tugs and trawlers. Paint the drawing. Sculpt a steamer, tugboat or trawler with clay. Find pictures or photographs of lighthouses. Draw and paint your own version of a lighthouse. Glue sand on the bottom of the paper (FOREGROUND) for the beach. Create clay lighthouses and paint them when they dry. Create clay sand sculptures or sandcastles using the Sand Clay recipe found on the following page. This clay is WONDERFUL to work with and it looks just like dried sand after it has hardened. This recipe will make about a dozen large, fist sized balls, so you should double it for a classroom. Combine water and cornstarch in a large saucepan. Do not turn on heat yet. Once this has been mixed, turn the heat on medium. Add the sand, a little at a time, as you stir constantly for about 10 minutes. (If you do not keep stirring, the heavy mixture will settle to the bottom of the pan and burn.) As the mixture heats it will thicken. Keep stirring after the mixture begins to bubble, for about one more minute, then turn off the heat and continue stirring until the mixture begins to look like a dough. Spoon mixture on a large dinner plate and spread it out to cool. Cover with a wet towel and let sit until it cools—about 45 minutes. When cool, divide into balls and store in a plastic sandwich bag. Keep refrigerated for up to a week. Sculpt just like clay. By the time Hopper graduated from High School, he had decided he was going to become an artist. His parents were worried that he should plan for a secure income so they talked Edward into studying commercial art. In 1899, at the age of 17, Hopper commuted to New York City to study at the Correspondence School of Illustrating. A year later he transferred to the New York School of Art. At the New York school of Art, Hopper’s talent was recognized with prizes and scholarships and later with the opportunity to teach Saturday art classes. In 1906, Edward, encouraged by his teachers, began to feel that it was time to travel to Europe to see the actual works of the great master painters that he had admired for so long. By this time, he was employed by the New York advertising agency C.C. Phillip and Company, where he worked part-time as an illustrator. But Hopper was restless and realized that he would never find total satisfaction doing illustration work. With the financial help of his parents, Edward left for Paris, the artistic capital of the world, in October 1906, where he stayed for almost eight months. 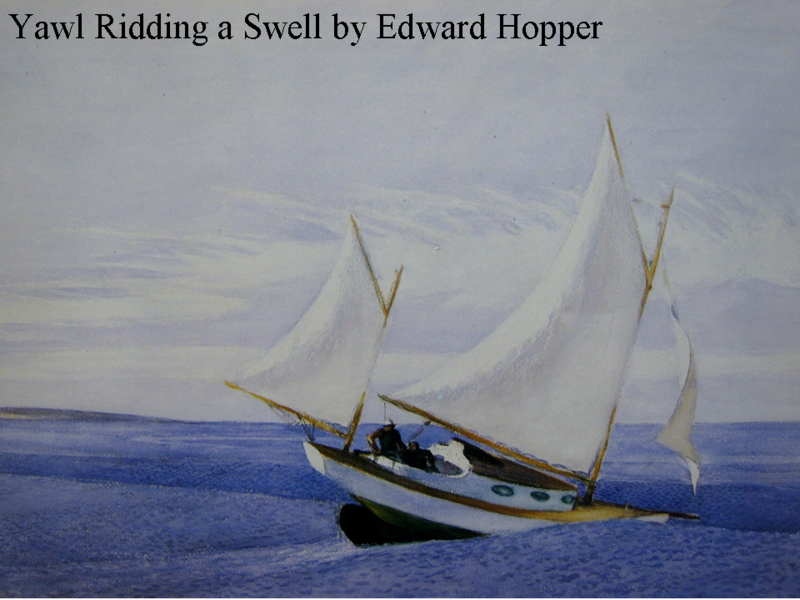 Edward Hopper worked as a commercial artist and illustrator for many years. He abandoned his painting for 10 years, in 1913, and devoted his time to commercial illustration. Hopper took up painting again at the age of 43. He spent much of his life traveling around the country, letting impressions gather in his memory. Periodically, he would return to New York City or Cape Cod, where he maintained studios, to paint. His affection for man-made objects led him to paint quiet lighthouses, empty bridges and fragmented city views in which the building took on more importance than the occupants. A yawl is a two-masted sailing vessel that has a large mainmast and smaller jiggermast. A mast is a structure or pole that rises above the boat and supports a sail. A swell is a wave. This painting is a watercolor and the other Hopper painting is an oil. Compare the colors. Which painting is brighter? How has the artist shown movement in this painting? How did Hopper make the waves in this picture seem less calm than the wave in his other painting? Besides hiding part of the ship behind a curved wave, he has dabbed darker blue paint spots all over the water. Create small sailboats using half of a walnut shell for the boat. Use clay to hold up a toothpick mast. Attach a triangle sail. Create a sailboat using a cork. Stab a toothpick in the center and attach a triangle sail. Have kids create a colorful design on their sail. Float the boats in a bowl of water. Winslow Homer was born February 24, 1836 in a comfortable, middle-class home in Boston, Massachusetts. Winslow was the second of three boys in his family. Winslow’s interest in art developed early. His mother was a painter. During the 19th century, painting with watercolor was a treasured “female accomplishment” taught in finishing school. All proper Victorian young ladies took art lessons but it was not considered proper for women to become real artists. Once they were married, most women put their paintbrushes away. 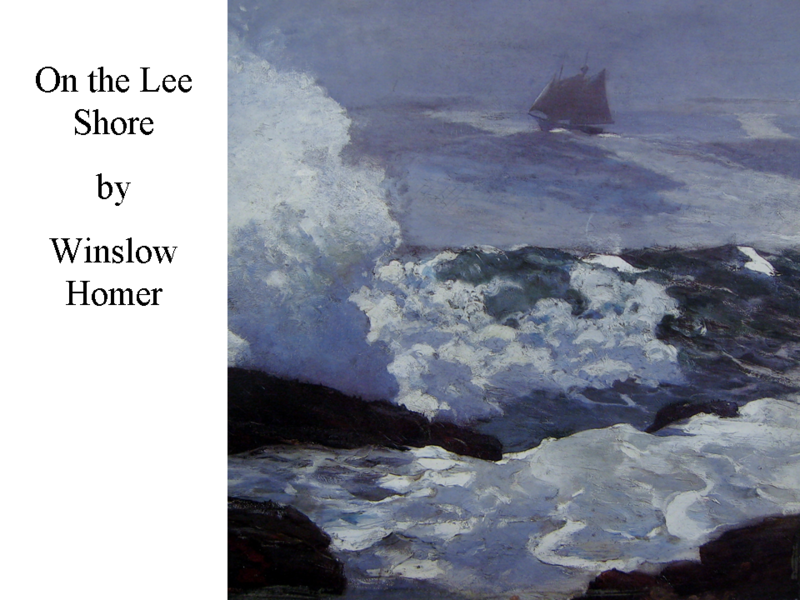 Winslow Homer’s mother was an exception. She continued to take lessons and create bright, accurate and decorative pictures of flowers. Winslow’s mother was interested in art, and in Winslow the artist, right up to the end of her life. Winslow had a talent for drawing and painting at an early age and some of his childhood works still survive. One of the most remarkable things about Winslow Homer was that he grew up to become one of America’s greatest painters without any professional art instruction—except for the instruction given to him by his own mother. At the age of 19, Winslow was apprenticed to a lithographer (a lithographer prints drawings [illustrations] for advertisements, programs, magazines, etc.). It was his job to create illustrations for covers of music sheets. Once Winslow’s apprenticeship was over, he became a free-lance illustrator for different weekly newsletters or magazines. By 1859, he was living in New York City. Winslow saved his best illustrations for Harper’s Weekly magazine. He covered Lincoln’s inauguration for Harper’s Weekly, in 1861. Harper’s also employed him during the Civil war to illustrate battlefield scenes. Few of his illustrations actually showed military action, since Homer preferred to concentrate on the camp life of the soldiers. His illustrations were more humorous or sentimental. After the Civil war was over, Homer focused his artwork on domestic life and happy scenes. Towards the end of 1866, he made his first visit to Paris, where he stayed for nine months. Winslow probably went mostly to see a couple of his own paintings, which had been selected for exhibition at the large Universal Exposition. 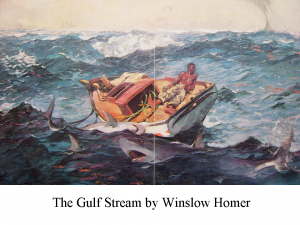 In Gulf Stream, Homer shows that tragedy can strike even in a tropical Eden. The result is the most disturbing picture he ever painted. In this picture, a black fisherman lies dazed, on the deck of a small boat, which has lost its mast. A waterspout (small tornado that has swept up water) is approaching and sharks swim around waiting for the man’s helpless, though still-living, body to be thrown to them by the wind. This painting is a familiar theme of Homer’s—man against the perils of the sea—and it tells a story. The artist has included a few significant details—a sheared off mast, bright red flecks on the water, the thrashing sharks in the foreground—to build a story that the viewer is invited to finish. An extra twist has been added by the ironic contrast between this scary story and its ideal setting—a beautiful, sunny, tropic sea in the Florida Keys. The artist has slanted the boat sharply, which forms a diagonal line that pulls the viewer directly into the picture. Can you see the damage that has been done to this sailor’s boat? What else can you see in the background, to the left? A ship far off on the horizon that probably can’t even see the man. There probably isn’t much hope for rescue by the far off ship so the man seems completely isolated. The sailor faces away from his danger and gives us the impression that he is ready to endure against even these terrible odds. Write a story about how the man got into this terrible predicament and what happened next. Did he survive? Were there other people with him on the boat? Did the waterspout catch up to him? Did anything else happen? Illustrate the ending of the story that this picture starts. Create stuffed paper sharks. Draw a large shark shape on a piece of white butcher paper folded in half. Cut out the two shapes and draw details like eyes, gills, fins and teeth one the opposite sides of the two shark shapes and paint. Staple or glue the two shapes together and stuff with crushed paper. The shark could be hung from a string, attached at the top. Younger kids might enjoy creating fishing poles using small painted dowels, yarn and a clothespin on the end to catch fish with. Kids can create several fanciful, colorful fish with construction paper and have their own fishing game. Bring in real watercolor paper for the kids to paint on. Have them tape the paper to their desks on all four sides, with masking tape. This will keep the paper from curling as it dries and leave a nice border for framing. Kids boxed watercolor paints will work fine on regular watercolor paper. You will probably want to cut the paper in half or smaller. Mount the finished picture on construction paper. Create a fishing game (see above). Review some of the points you touched on in your presentation by attaching questions to the back of several fish. Ask questions about the artists and their paintings and about seascapes. Kids take turns fishing for a question to answer. This activity even works well with older grades because it is so unusual. Give older classes more questions to answer and younger kids only a few. Call on kids who have been good listeners and participators in the discussions. Let kids know ahead of time that you will be looking for good participators to help with an activity at the end. When he returned to the United States, Winslow continued his work as an illustrator for various magazines and books. In the summers of the 1870’s, he visited the White Mountains, the Adirondack Mountains, Gloucester, Massachusetts, and a farm in upstate New York. During this time, he began painting with watercolor. 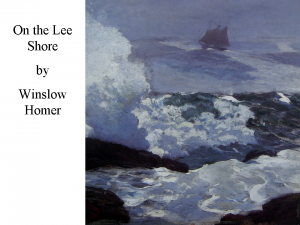 When Winslow Homer’s mother died, in 1884, he moved to Prouts Neck, on the coast of Main, where he lived for the last 27 years of his life. Most of his Seascapes were painted there. Winslow often traveled with his brother (during the 1880’s and 90’s) on hunting trips to the Adirondack Mountains and, during the winter months, to Florida, Bermuda and Nassau for fishing trips. 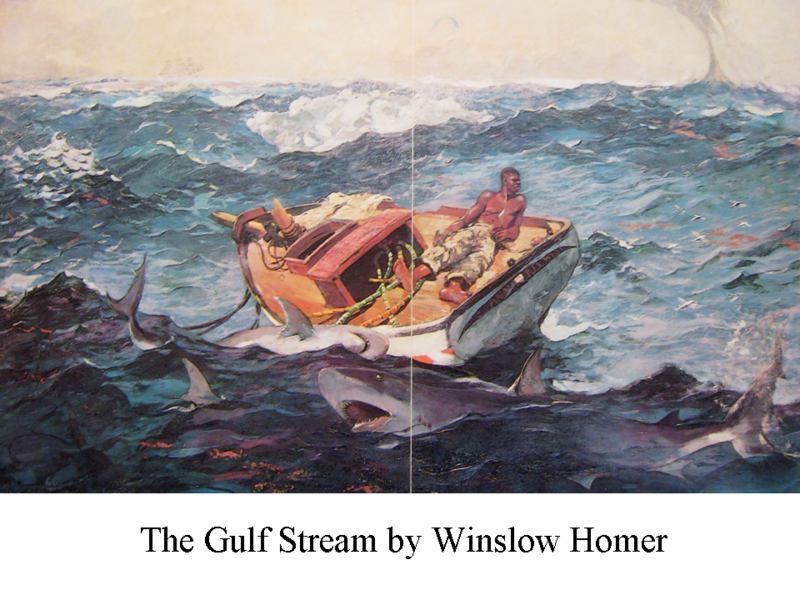 From about 1884 on, Winslow painted mostly Seascapes. At first, his paintings showed the struggle of men who earn their living from the sea. Winslow shows man against nature in this painting as we see men hauling their catch aboard their small boat, just before fog or heavy seas overwhelm them. Their boat is small. Notice how one fisherman is leaning out of the boat, over the water. This seems like a very dangerous pose. We can only see part of the net and it is filled with fish (herring). The two fishermen are emptying the herring from the net into the boat so they can row for shore. It seems that the boat will be a tight fit for the two fishermen and all the fish from their net. 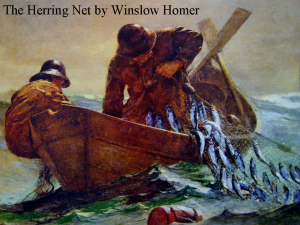 Come into the classroom dressed like the fishermen in this painting and carry a fish net with you. This will create interest in the topic and a sense of fun for the kids! In the later years of his life, Winslow (who never married) lived very much like a hermit, at Prouts Neck, on the Atlantic coast. He was a private man who did his own cooking, laundry and housekeeping. 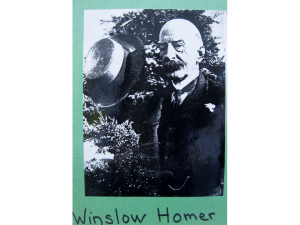 Winslow also took care of his aging father, who died just twelve years before he did. As he got older, Winslow began to leave people out of his paintings, just like in this painting. At the age of 74, Winslow died of a heart attack, on September 29, 1910, while at home in Prouts Neck, with his two brothers, Charles and Arthur. A “Lee Shore” is the area toward which the wind is blowing. Notice the sea spray from the wave hitting the rock on the left side of the picture. The boat and sky are very dark, like a storm is blowing in. There a many foamy white waves in the foreground and middle ground. Homer has painted this picture as if we are standing on the lee shore looking out towards the sea. Can you feel the wind blowing in your face? William Glackens was a born illustrator but oil painting was difficult for him. He spent long and tedious hours at his easel, yet his paintings seemed spontaneous. 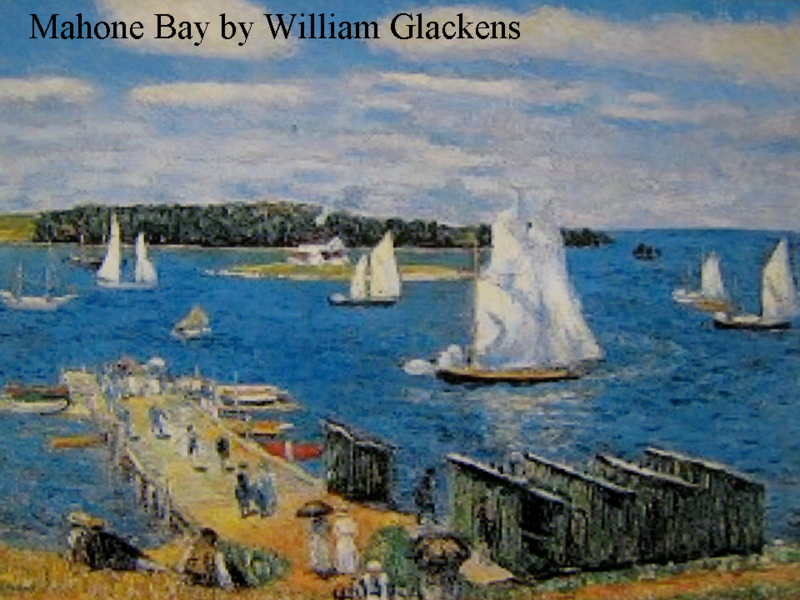 Despite the difficulty and hard work, William Glacken’s first love was painting. Glackens made his living as a newspaper artist-reporter (illustrator). His job was to rush to the scene of an accident, fire, or other news event, sketch it and return the drawing to the paper for reproduction. Pictures of breaking news events were a sure way to sell newspapers and were part of the competition in the circulation wars between newspapers. This job gave Glackens training in capturing a scene quickly and exactly. He had to develop a fine grasp of detail, a straightforward style and a flavor for the drama of the event. Glackens was extremely good at remembering details. His friends liked to play a game with him. They would ask him to describe a room they had just left. He never forgot a thing, from the molding on the walls to the kind of flowers on the table. Glackens spent every spare moment depicting vignettes of city life in which he combined his photographic eye with an exquisite feel for color. Glacken’s last assignment as an artist-reporter was covering the fighting in Cuba, during the Spanish-American war. He then continued to work as a greatly admired illustrator for LIFE magazine but mainly supported himself and his family with his work as a commercial artist, painting everyday New York life. Glackens painting style shows a close influence of the later work of Renoir (a French Impressionist artist). Renoir painted French Seascapes, with sailboats and French people, at the beach or the docks on a sunny day. 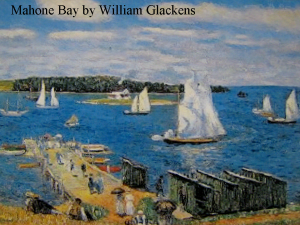 William Glackens painted American Seascapes with American people at the beach. The paintings had many similarities. Notice the dabs and strokes of paint color that create this picture. This way of painting creates an “impression” of a sunny afternoon. The painting lacks the fine details that are created when an artist blends the paint smoothly on the canvas. Glacken’s pictures are like visual vacations! If you have any snapshots of your family at the beach, bring them in to share with the kids. These are pictures of American people at the beach, just like Glacken’s paintings. What is different about their clothing? Glackens lived during the late 1800’s and the early 1900’s and your photographs were taken recently. Have kids create a picture of themselves at the beach, showing what they enjoy (or would enjoy) doing there. Kids could also create a picture of their own family or friends at the beach. Create picture frames decorated with seashells and sand. These could make a nice gift for mom or dad by framing an original seascape created by the kids. Small seashells can be found in craft stores and are fairly inexpensive. Frederick Childe Hassam, as he was known for a brief moment, was born in Dorchester, Massachusetts, on Oct. 17, 1859. His father, also named Frederick, was a successful Boston merchant. Childe studied at the Boston Art School, was apprenticed to an engraver who taught him the techniques of engraving, and began his career as an illustrator. Childe went to Paris to study art in 1883. This was the time in Paris where the peak influence in artistic styles was Impressionism. When Hassam returned to America, he began to paint in the Impressionistic style. His main concern in painting was to capture the effects of sunlight. Childe used patchy brushstrokes, like the French Impressionists, to capture light and atmospheric conditions, such as mist. Americans had a hard time accepting the Impressionistic art style that was beginning to be popular in Europe. The American art world mainly consisted of artists who copied the accepted, traditional art of Europe. The Impressionists were not considered traditional. Hassam was important in introducing the impressionist painting style to Americans. He formed a group of American artists called “The Ten” that were Impressionist-oriented painters. The colors of this painting make it stand out from the other seascapes in the packet. This painting has more warm colors (yellow, orange) than most of the other paintings, which are mostly cool colors (blue, green). This painting is created with dabs of different colors of paint in the Impressionist style. Most of the water is yellow and blue-green. There are also some dabs of orange in the water. Can you find the reflection of the sunset in the water? Can you find the sun that is low on the horizon and covered by a little haze? The reflection heads towards the foreground just in front of the sun, which is located to the immediate right of center. What colors can you find in the sky? What color is the horizon line? Cut out a larger silhouette of a sailboat from black paper. Pattern your silhouette after the smaller boat the artist has painted in the background. Hold the larger ship on the picture, close to the horizon line and ask the kids if they think this ship fits into the picture. Could it just be a larger ship? Why did the artist paint his ship so small? Because it is farther away, Add an even larger sailboat silhouette to the horizon line of the picture. Ask the kids how the boats should be arranged to make the picture look good. There is enough empty space on the picture to show and explain this simple example of the principle of PERSPECTIVE—relative size. Cut several triangle and half circle shapes from sponges. Younger kids could use white tempera paint for the sails of their ship (triangles) and different colors from the boat (half circles). Create a background from a half sheet (cut horizontally) of dark blue paper glued to a full sheet of light blue. Add a sun to the horizon. 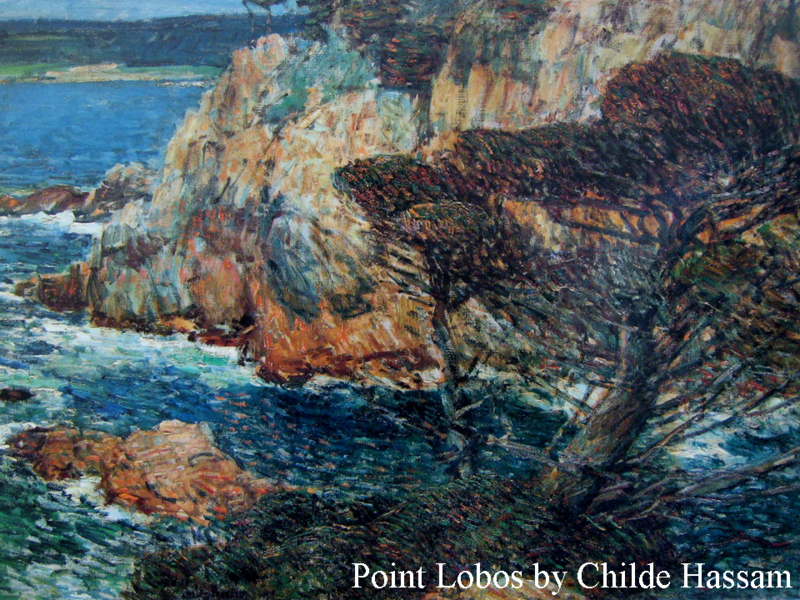 In 1908, Childe Hassem traveled to Oregon to paint. He stayed in Oregon and painted for several months. Childe created several paintings that were views of Oregon’s Mt. Hood. The Portland Art Museum has a couple of Childe Hassem paintings in its permanent collection. If you have the chance to visit the museum with your family, be sure to ask someone where to find a Childe Hassem painting. Original paintings are much more interesting to look at than just a copy or print of the painting. All the paintings in this packet are only copies of the original paintings. Real paintings would cost much more money than the copies and we would need to be much more careful with an original painting, so scratches or fingerprints wouldn’t damage it. If you get a chance to go to the Portland Art Museum and you see a Childe Hassem painting, write down the name of it and let me know which painting you saw! If you get to see one of Hassem’s real paintings, you will notice that it doesn’t have a smooth texture, the way these copies of his paintings do. 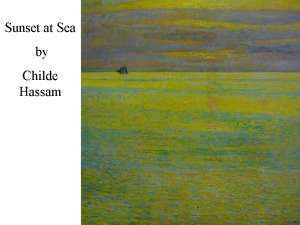 If you get to see a real Hassem painting, be sure to look closely and notice the way he paints in the Impressionist style—many dabs or strokes of colors, all mixed together. 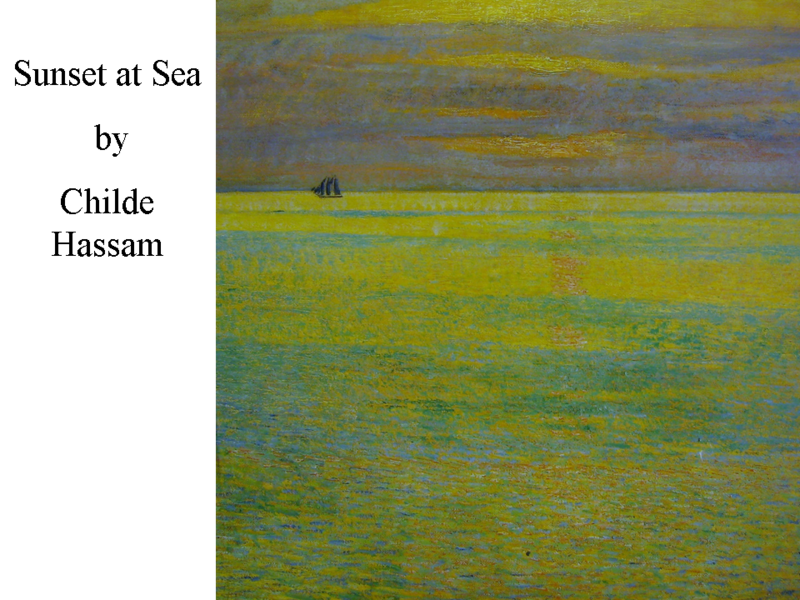 Childe Hassem’s art career lasted for fifty years. He died on August 2, 1935, at the age of 76. This painting shows rocky cliffs near the edge of the sea. A windswept tree can be seen on the right. Can you see ledges on the cliffs where green things are growing? This is an impressionist painting. If you put your face close to the picture, all you can see are small dabs of color. Up close, it’s hard to tell what the picture is. As you get farther away, the picture is easier to see. Review what warm and cool colors are (especially grades 2-5). Which colors are more dominant in this painting, warm or cool? Compare the dominant colors of this painting to the colors of Sunset at Sea. Draw this Sea Creature using simple lines and shapes!